I’ve mentioned Halo liquid before on my list of best e-liquid suppliers, but until now I haven’t had an opportunity to discuss the company’s e-liquids in detail. Halo liquid is without a doubt some of the most popular on the market, and with good reason. Halo releases a new flavor only when they really think they have a winner, and each flavor has its own dedicated audience. I think that some of the flavors may have a bit more mainstream appeal than others, though, and I’d like to discuss those flavors in my Halo liquid review. Halo Cigs Coupon: Want to save a bit of money on your purchase from Halo Cigs? Use the coupon code VAPE4LESS to save 5 percent on any order. In case you’ve been unaware, Halo Cigs is an e-liquid and e-cigarette company that was first launched in the United States in 2009. After a quiet beginning, Halo has slowly built up a dedicated customer base and now receives an estimated 6,000-plus visitors each month. Halo’s claim to fame is the fact that they are one of the first major e-liquid companies to produce its liquids here in the States rather than reselling e-liquid made by a supplier in China as most e-cigarette companies do. I’ve been told that an overwhelming percentage of Halo’s business comes from repeat customers, which should tell you something about the quality of the products. I also believe that Halo Liquid was some of the first to have a lot number printed on each bottle for quality control, which is a practice most major e-liquid companies have since adopted. Halo’s liquid design priorities include creative flavors, high vapor production and a solid feeling of nicotine satisfaction, even at lower nicotine concentrations. Halo has been around for a long time and some of their older liquids have dedicated fans. If you ask me, though, Turkish Tobacco is the best Halo liquid overall. As a tobacco lover, it reminds me of the things that are so right about the experience of smoking tobacco — the rich, slightly sweet flavor, the little scratch in the throat — without making me recall the wrong things, like the nasty smells and the yellow stains on my fingers. Turkish Tobacco is the Halo liquid to try if you’re looking for something that really reminds you of the best aspects of tobacco. If you’re a former menthol smoker, you’re probably not looking for the dry, warm vapor that a tobacco e-liquid produces. You probably want something more on the cool, smooth side. 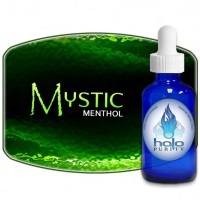 Halo produces several menthol liquids and of these, Mystic Menthol is my favorite. For me, the best menthol e-liquid is one with a pure flavor rather that’s as far as possible from tobacco smoke. At the same time, I don’t want a lot of sweetness to muddle up the flavor — something common in minty e-liquids. Mystic Menthol hits the right notes with lots of menthol and a neutral mint flavor. I prefer an e-liquid with almost no sweetness, but I know that plenty of e-smokers go the other way and absolutely love sweeter e-liquids. I’ve been told that Tribeca is the best-selling Halo liquid, and I can definitely see why. Although it’s in the “tobacco” flavor category, it’s actually a combination of sweet flavors such as vanilla, caramel and toasted nuts. When you put all of these flavors together, you get something that somehow resembles tobacco even though it doesn’t taste like any tobacco product you’ve ever smoked. A lot of e-smokers like to talk about something called “throat hit” — the little bit of irritation that you feel in the throat and lungs when you inhale smoke. This sensation comes mostly from nicotine, but it also comes from smoke — something that an e-cigarette doesn’t produce. Torque 56 is a Halo liquid designed with the goal of producing a throat hit as much like that of a real cigarette as possible. This is a strong e-liquid with an intense flavor that should appeal to people who smoke more heavily than average or prefer full-flavored cigarettes. I know a lot of pipe smokers might be reading this, and more than a few people have fallen in love with pipe blends consisting of tobacco and fruit. 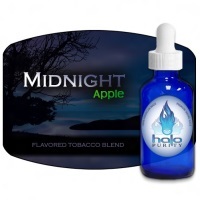 Midnight Apple is Halo’s attempt to recreate this experience with an e-liquid containing a smooth tobacco flavor and a hint of green apple. This one tastes so good that I really think it might appeal even to people who have never smoked pipe tobacco. The green apple flavor is a bit candy-like and not entirely natural tasting, but combined with the tobacco flavor it works really well without a lot of sweetness. Although I don’t use sweet e-liquids every day, every once in a while I like to use something with a really nice dessert flavor so I won’t be tempted to gorge myself on sweets. 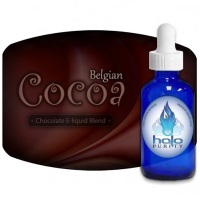 When I’m in that mood, Belgian Cocoa is the Halo liquid that does the trick for me. If you like the flavor of sweet dark chocolate, I really think this is an e-liquid you’ll like — even if you’ve tried another chocolate e-liquid and didn’t enjoy it. Belgian Cocoa tastes like a chocolate that you’d actually want to eat. Not a fan of Prime 15?